The WHO (World Health Organisation) reconises that Acupuncture can be an effective method for treating a number of illnesses based on clinical experience. Acupuncture is a gentle medical system that is used to diagnose and treat illness, prevent disease and improve wellbeing. It originated in China more than 3000 years ago and due to it's proven effectiveness has been embraced throughout the world. Acupuncture can be used alone or combined with Western medicine or with other forms of Traditional Chinese Medicine (TCM) such as Herbal Medicine and Moxibustion (Heat Treatment). Most people find acupuncture painless, they describe the treatment as calming and relaxing. Many people find when they begin a course of acupuncture treatment they experience positive changes in their overall state of health. They may, for instance, find that they sleep better, feel more relaxed and have a more positive outlook. Since each person is unique the number of treatments will vary. Chronic longterm conditions can take longer to treat that acute conditions that have just occurred. If the patient is in general good health recovery may be quicker. Also the frequency of treatments prescribed will have an impact. Initally treatments may be administered close together and then become less frequent as the condition improves. The adherence of the patient to the instructions provided can also influence the speed of recovery. The practitioner will usually discuss the treatment programme with the patient. Most people would describe the treatment as relaxing and calming. Occasionally 24-48 hours after treatment some people may experience slight mood changes as well as physiological changes such as alterationsn in bowel and bladder function. It is possible in some cases for symptoms to become temporarily worse. 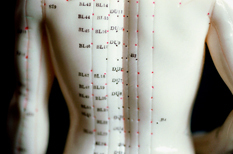 This usually indicates to the acupuncturist that the body is responding to treatment. If you have any concerns please bring them to the attention of your practicioner. Acupuncture is a safe and effective treatment when performed by a well-trained, conscientious practitioner. All our members use pre-sterilised, disposable needles. If you are pregnant or trying for baby it is important you let your practitioner know as the treatment will need to be modified as Acupuncture is used extensively for fertility and pregnancy issues.